Higgs Communications, LLC was founded by Simon Higgs in 1989 to provide consulting and expertise in what has recently emerged as the "new media" industry. Prior to 1997 the company was known as Higgs America. As an accomplished musician, artist and designer with formal training in art, music and telecommunications, Simon Higgs provides expertise in the converging media industries. Equally at home in the recording studio, sound stage, or data center, Simon Higgs has credits, in no particular order, in electronic publishing, online security, Internet, interactive television, and music and entertainment industries. Very often, projects span multiple disciplines and/or industries. Simon Higgs was trained in telecommunications, in England, by British Telecom in the early 1980's, where, after graduating, he specialized in leased business circuits and the newly emerging digital PBXs (including those built around IBM mainframes). After a work-related accident, he left British Telecom to attend the University of the Nation's Academy of Performing Arts in Cambridge, Ontario, where he studied theatre under Colin Harbinson, and toured the US, Canada, and Central America as "Big Ted" in the award-winning play Toymaker & Son. After the tour was over, he later returned to the campus as a staff member to help manage the audio/visual department. In the late 1980's Simon Higgs moved to the Los Angeles to study music. 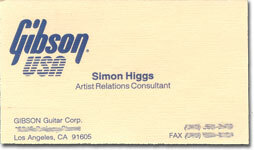 While studying at Musician's Institute's Guitar Institute Of Technology (GIT) in Hollywood in 1990, Simon Higgs was hired by Gibson Guitars as an Artist Relations Consultant where he worked with numerous headlining artists. Gibson also provided exposure to international marketing campaigns in print, radio, TV and movies and he was also able to vastly expand his computer music knowledge in support of the Oberheim product line. It also opened the doors to music software beta testing opportunities and participation in online music forums such as PAN. Long before Napster and web cameras went on sale (and even before the "Mosaic" web browser was released), Simon Higgs was delivering music and video across the internet legally. In 1992, he discovered that there were no royalties being collected from downloads of popular MIDI files from online BBS's (the missing publishing royalties were worth an estimated $50 million at that time). He published his findings in 1993, as a series of articles in the music press, outlining both the benefits and pitfalls of music downloading. Towards the end of 1993, Simon Higgs was hired by Electronic Cafe International to consult on an interactive TV project with Viacom that had artists performing together from different physical locations, thousands of miles apart. From that project, he produced one of the first Quicktime movie clips (of a Thomas Dolby performance) to be distributed over the internet via Stanford University's "info-mac" ftp archive. In 1994, as the CD-ROM began to emerge as a serious multimedia distribution platform, Simon Higgs edited the video footage from Charlton Heston's Voyage Through The Bible - New Testament television miniseries that Mr. Heston had made in 1992 for the Arts and Entertainment Network. The resulting CD-ROM included the complete King James Version, as well as readings by Mr. Heston and film footage of the Holy Land. As the world wide web also began to emerge in 1994, Simon Higgs enabled his first commercial web customer, Marshall Industries, the fifth largest domestic US distributor of industrial electronic components, to increase revenues from $500 million to $2 billion within five years. Later in 1994, Simon Higgs founded Coupons.com, which, in 1996, under the brand name CouponNet®, won the CommerceNet '96 VIP Award for Best Online Community. Higgs Communications eventually sold Coupons.com in January 2000, whilst retaining the successful CouponNet brand as an affiliate marketing portal. In 1995, Simon Higgs was asked by composer Christopher Franke (ex-Tangerine Dream) to build an electronic commerce web site for Sonic Images Records, to celebrate the release of the Babylon 5 TV series soundtrack CD. Making promotional snippets of the tracks available on the popular onlines services (AOL, CompuServe, etc. ), as well as from the Sonic Images web site, online sales of the CD were made within hours of the web site coming online. This was one of the very first web sales programs by a record label. Also in 1995, Simon Higgs built the network infrastructure and web site for MacTech Magazine, the Apple Macintosh programming community's primary source of information outside of Apple. Some of Simon Higgs' work, in 1996, with IANA and the IETF on new top level domains is covered in Milton L. Mueller's "Ruling the Root: Internet Governance and the Taming of Cyberspace" (published by MIT Press). Simon Higgs has also written several Internet Drafts, which, while firmly on the cutting edge, have been considered by some as highly controversial. Between 1997 and 2000, Simon Higgs assisted with the design and planning of the web infrastructure of the Defense Logistics Agency's Defense Contract Management Command (DCMC), which culminated in the creation of the Defense Contract Management Agency (DCMA) in 2000. At the same time, he was involved in projects for the Department of Veterans Affairs (VA) and DoD's Composite Health Care System II (CHCS II) which has since been renamed the Armed Forces Health Longitudinal Technology Application (AHLTA). In 2004, Simon Higgs co-founded 9 lizards productions, a next-generation television production company specializing on creating content for on-demand broadcasting. Also in 2004, Higgs Communications published Simon Higgs' definitive book "The Guide To Selling Your Music In The iTunes Music Store" which has been sold in over 23 countries. It has received a number of positive reviews including C|Net, EQ and MusicTech magazines. Since late 2005, Higgs Communications has provided digital distribution services for artists & labels in the iTunes Music Store and provides an ongoing consultancy for digital music distribution. Higgs Communications now has over 100 artists (including several Grammy-winning and Emmy-nominated artists) using their services. In September 2006, Simon Higgs went to India & Nepal to help set up a new production company, Indigika East, with members of the Vineyard Music Himalayas team. This included the establishment of a brand new Pro Tools-based recording facility in Siliguri, India. 2007 saw the creation of four complementary web forums under the Wattkins Amp Forums brand, dedicated to the design and construction of vacuum tube guitar amplifiers. Many recent innovations in vacuum tube guitar amps have had their origins in discussions in these forums including variable voltage regulation and the design of quality printed circuit boards of classic amp designs such as the Fender '59 Tweed Deluxe as well as several effects pedals. Simon Higgs was hired by Zemaitis Guitars to assist with the 2008 & 2009 NAMM shows. Working with Zemaitis' warranty center in the US, Lipe Guitars, he produced a proof of concept guitar amplifier for each show. He also created a Zemaitis Guitars gift application on Facebook. He built two custom amplifiers for the Lipe Guitars booth for the 2012 NAMM show. In 2009 and 2010, Simon Higgs provided expert testimony and prior art discovery for Coupons.com, Inc., News Corporation and The New York Times which resulted in the successful conclusion of several patent lawsuits. Working with custom boutique guitar amplifier manufacturer 65 Amps, Simon Higgs helped with the launch of their new Red Line by building some of the initial production run of the London Pro guitar amplifier in 2011. He has also designed several effects pedals for 65 Amps. Higgs Communications is also the parent incubation company to several innovative projects, including the WWW Clock, NSA Records, CouponNet® (winner of the CommerceNet '96 VIP Award for Best Online Community), and 9 lizards productions.